The Michigan Judicial Tenure Commission tasked with investigating allegations of judicial misconduct has filed a formal complaint against Judge Lisa Gorcyca who ordered the Tsimhoni children (presently ages 10, 11, and 14) to juvenile detention for refusing to have lunch with their father who they claim is abusive. She famously threatened, bullied, and insulted them during their June 24th sentencing hearing, even comparing them to the disciples of criminal cultist Charles Manson. Then, as public attention dwindled, appeals to have her removed from the case were denied and the children remained at her mercy. Now, her impunity may be coming to an end. The Judicial Tenure Commission responsible for investigating complaints of judicial misconduct charges Gorcyca with two counts of misconduct which encompass more than 16 separate violations. The first count refers to the June 24th sentencing hearing, accusing Gorcyca of improper demeanor, failure to act in a dignified manner, laughing at the children, raising her voice, and misrepresenting law and fact. The second count alleges misrepresentations in Gorcyca's response to the commission's earlier 28-day letter. Among these alleged misrepresentations are Gorcyca's claims that she "did not find the children in contempt" and that her gesture of "making circular motions at her right temple" was not meant to indicate that 14-year-old Liam was crazy, but to refer to "the forward motion he would make in therapy." The formal complaint resulted from the commission's independent investigation and has been submitted to the Michigan Supreme Court. Judge Lisa Gorcyca must respond to the complaint within 14 days after which a disciplinary hearing will be held. Potential disciplinary actions could include admonition, fines, removal from office, or other censure, but sanctions alone will not rectify the children's present circumstances or restore their well-being. Although Judge Gorcyca transferred the children from detention to camp in response to public outcry, she then proceeded to order them to traumatic and controversial "therapy" and place them in the custody of the father they chose juvenile detention over interacting with. According to the redacted exhibits offered to support the recent motions filed by the mother, Maya Tsimhoni, the children have since been described as "depressed, frightened, ill, [redacted], exhausted, despondent, tearful, struggling in school, absent often from school, and missing their mother, their pets, and their real home." Now, instead of returning the children to their mother with whom they thrived, a therapist has recommended that the oldest son be placed in wilderness camp and the young daughter be placed in foster care. What will the Tsimhoni children learn from this ongoing injustice? Will it be that the system punishes victims rather than protects them? How will they trust the system which betrayed, belittled, and blamed them when they reported abuse? What punishment could possibly equal the suffering of the children who were so egregiously bullied, wrongfully incarcerated, and traumatized? In the words of Elie Wiesel, "What hurts the victim most is not the cruelty of the oppressor, but the silence of the bystander." The children have clearly continued to suffer at the mercy of Judge Gorcyca, yet the Michigan courts have thus far failed to intervene on their behalf. The Tsimhoni case could set a precedent in family courts across the country. Whether this precedent is one of gross negligence and relative impunity, or immediate reform and appropriate censure, will be for The Supreme Court of Michigan to decide. 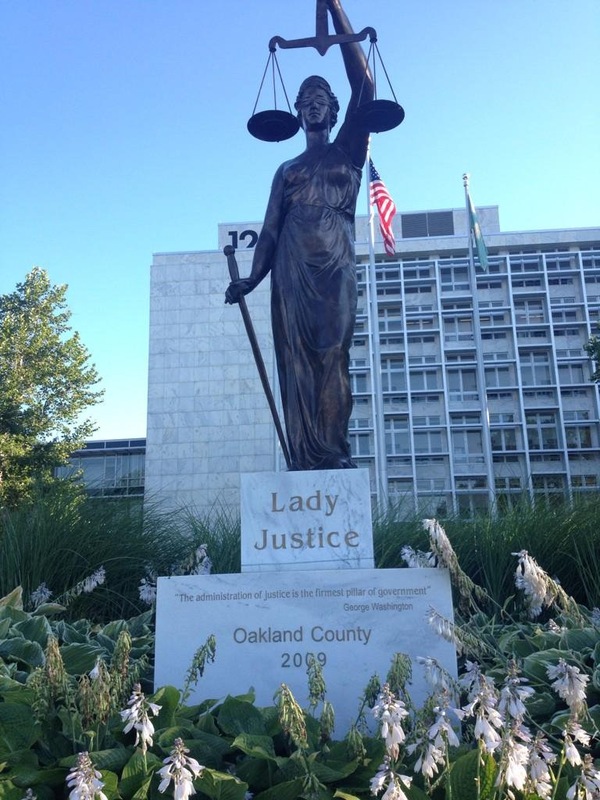 This statue stands outside the Oakland County court house where Judge Lisa Gorcyca sentenced the Tsimhoni children (photo via Hope Loudon).